Today I brought Hawaiian Punch, Cola, icing, and marshmallows to school with me. Probably some of the least teeth healthy food known. Believe it or not, they all had a purpose. Of course, the children just wanted to eat everything. Can you imagine what Mom and Dad would have thought about that? The Hawaiian Punch and Cola were for a fun science activity we did. 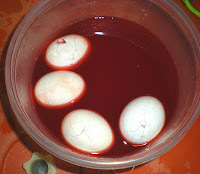 I had hard-boiled(thank goodness) six eggs and brought them to school also. I poured the punch in one bowl and the cola in another bowl. 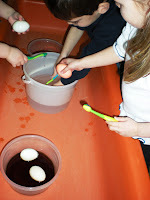 I told the children we were going to pretend the eggs were teeth. I wanted to show them what happened to teeth when we drink sweet drinks like punch and soda. 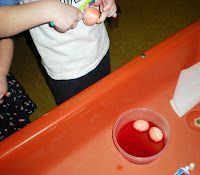 I placed 3 eggs in the punch and 3 in the soda. 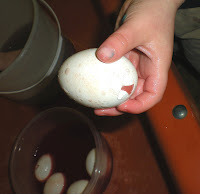 After a couple of minutes the eggs turned colors. 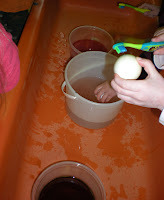 I got a toothbrush and toothpaste and brushed the egg to show the children how brushing our teeth helps to get them clean. 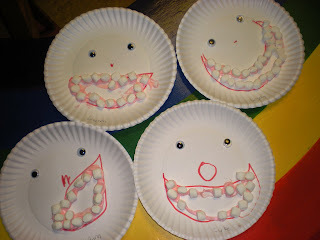 During free time I had this activity out for the children to enjoy. I had lots of broken "teeth" by the end of the day, but they had a great time. Alexandra over at Preschool to Pre-K said she also did this acitivty. It is really fun! 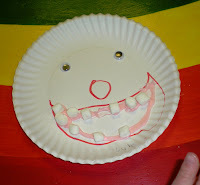 Each child got a paper plate, they glued on two google eyes, drew a nose, and a BIG mouth. They then squeezed the icing out of the bag along the inside of the mouth for gums. Finally they added mini marshmallows for teeth. I know it's not that "tooth friendly," but it was sure fun. There is another great activity-and a lot more healthy-over at Celebrate Every Day. She used apples, peanut butter, and mini marshmallows. I was thinking if you can't use the peanut butter, you could always use pink icing. I read the book "Curious George Goes to the Dentist," by Margaret Rey. Who doesn't love George? We finished up the day with some exercise to "Mousercise." This is always great fun for the children. We have had Mousercise at our school forever. It was there when I got there. You know what that means? It is not a CD it is a record. Nowadays, when I bring it out, the children always say, "That's a really big CD!" I always think that's funny. I haven't upgraded to the CD because I think the price is pretty high. The record still works well. 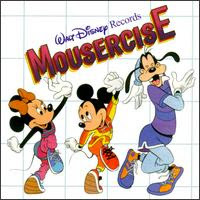 I remember Mousercise! We had the same record when I was a kid! I love the science experiment! Brushing the eggs. You are having way too much fun. You don't cease to amaze me-Can I please come and teach with you for a day??? So cool. 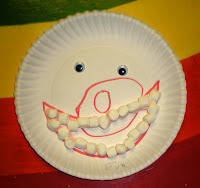 I love all the teeth activities, my 3 yr old wants to brush 5 times a day! She's also fascinated with bones/skeletons (including teeth). Thanks for the fun activities!